Over the last weeks I have finished reading two historical cookbook – this is the first of those. 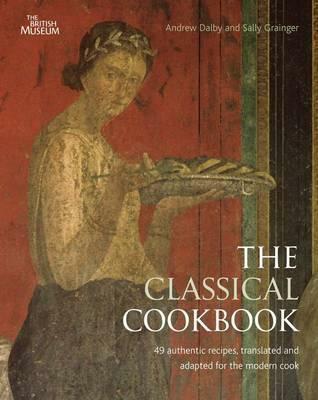 The book focuses on the Mediterranean antiquity’s cook – with a heavy focus on Greece and Roman cooking – and it does an excellent job of it. My copy is now full of post-its of recipies I want to try out and I ended up sending my dad and my uncle recipes from the book. I have however not tried any of the recipes yet. You will see pictures once I do. The book reads very well as a history book on Anicent food history as well as a cook book. The chapter introductions along with the recipe introductions paints a vivid picture of the foods eaten. Many of the recipes are accompanied by quotes from ancient texts and cookbooks which half the entertainment. What the book do lack is pictures of the dishes – there are however pretty pictures of objects from the period as well as of paintings and mosaics. The book is full of good history as well as cooking advice and recipes. It’s really enjoyable reading. Each recipe has a the original recipe, a very useful intruduction of the dish, an ingrediance list and an instruction on how to cook it. There are quite a few recipes I want to try out and some I want to see if we might just like to eat on a normal evening. If you are interested in ancient everyday history or a reenactor I think this is well worth your time.